I think this derives from the long-standing progressive-left view of education as an instrument of social policy, in which academic disciplines (and pretty much everything else) were subordinated to the raw social objectives of something between an induction and indoctrination process for society’s young. This was a fore-taste of the reservations I increasingly experienced about the whole way the educational establishment runs things: I unashamedly went into teaching in part from a desire to work with, and educate others in, my specific discipline. I was not best pleased to hear that such things were to be relegated to bit-parts in some grand scheme of social manipulation. The surprising thing is that this agenda has lasted so long: the stimulus for this post was John Tomsett’s recent rumination on the nature of subject-specific pedagogy, which implied that the notion of subject disciplines having intrinsic importance for how people teach is still unfamiliar or even bizarre to many. Geography suffers particularly in this respect: for decades it has been a Cinderella subject. The public still seems to think it consists of memorising lists of capital cities, while even its exponents often fail to see it as a repository of discrete expertise. I think this derives from the fact that to those concerned, it appears to study the blindingly obvious. In recent months I have become involved with the production of the local Neighbourhood Plan – and the ensuing discussion with both those involved and the community at large has revealed this for the myth that it is. It has become clear that local developments and dynamics which were indeed blindingly obvious to me (and another local geographer) seemed largely invisible to many others, to the point that they required significant explanation. What geographers see and understand about the world is certainly not blindingly obvious to those not thus trained. But such training is extremely useful in ‘reading’ the world around us in a complex way – and for that reason, if no other, I would have thought that this subject-specific expertise is highly desirable. The fact is, geographers, like all other academics, live their subject to the point that they cease to notice – and this then saturates their teaching with not just specific content but an entire mind-set that is unique to their, as every, discipline. Many of those who were supposedly ‘leading teaching’ in my school were from the pure and applied sciences – including the usual share of overly-competitive ex-P.E. teachers. My experience suggested they never did understand (or perhaps care) why those of us who taught arts and humanities had such difficulties with the concept and application of linear, measurable progression that they were happily using. It was only when I first observed and then taught some basic maths that the utter foreignness of not only their techniques, but also their mindset became apparent. By then I was a highly-experienced humanities teacher – but I struggled greatly to do justice to even basic maths: the required approach was just too alien to my own. It is tempting to regard this as a case of systemisers versus empathisers: those running the system largely came from technical subjects, whose approach (and perhaps general world-view) was compatible with a mechanistic, linear, quantitative approach; almost none of them had any grounding in the more interpretive, evaluative subjects of the arts or humanities. And being systemisers, they were quite happy insensitively imposing technical-fix approaches on their colleagues in blissful ignorance that it is simply not possible accurately to assess the skills of critical argument, let alone emotive creativity required in such subjects in such reductive, linear ways. It became clear that it was most certainly not a matter of it being ‘all just teaching’: those subject-specific skills were so deeply-imbued that their practitioners (including me) often failed to recognise them for what they were. And yet they (necessarily) coloured our entire view of what we were doing. Csikszentmihalyi observed a similar divide between psychologists and surgeons: the latter loved ‘practical, mechanical medicine’ and despised the former as wishy-washy, while in their turn, the psychologists revelled in the subtleties of reading human behaviour and despised the surgeons as crude mechanics. And ne’er the twain shall meet. This is why it is essential that one group must not gain hegemony over the other. To return to the notion of teaching being primarily a matter of social engineering, there is a deep irony here. My objection is certainly not in the desirability of improving people’s life-chances, but to the fact that due to the foibles of human nature (which systemisers often ignore), direct attempts at achieving it rarely work – and are highly vulnerable to political misappropriation. On the other hand, people who learn the basics of geography (and every other specific subject) actually end up equipped with very real life-applicable knowledge, taught by people for whom the appropriate mindset is second nature. Incidentally, we might also reflect here on the unseen consequences of the widespread use of non-specialist teachers. With the greatest of respect to John Tomsett, to be mystified or bemused by this betrays the extent of the error perpetrated by those for whom education is only a form of direct social engineering. That even reflective individuals such as John are only just reconsidering this shows just how deeply the approach has penetrated the whole profession. I find it hard to believe that they (who must all have their own subject specialities, too) could have been quite so greatly taken in. Or at least I would if I hadn’t been too, for quite some time. (While I ‘felt’ there was something wrong, it took many years to pin-point it). Those who, from classical times onward, formed the body of education around the study of discrete disciplines knew more about what they were doing than the modern outlook credits. Academic subjects are more than simply a vehicle for delivering education: they are education itself. It seems that many in educational circles who have believed otherwise, but who may now be thinking again, have spent the last forty years in effect reinventing yet another wheel. It seems to me that in Britain, by comparison, there is a sense of disempowerment – that people have less real control over their lives, that there is less active engagement with living a good life. I contrast this with the very passive act of consumption that seems widely to dominate people’s attention. I’ve never really been able to separate the extent to which that might be caused by the legacy of a hierarchical society, or because people have willingly devolved responsibility for their lives to the political or commercial sector. Either way, one might argue that one of the purposes of education is to equip people to resist the forces that diminish their autonomy. If I am correct, this passivity is precisely what one might expect a lack of education to cause. Clearly the U.K. does not lack education – but perhaps it is failing to deliver in this critical respect. I can see no other reason why so many people are prepared to live insubstantial, pre-packaged, cloned lives at the expense of any sense of their own individuality. “Because I’m worth it” has been misappropriated from being an inward expression of personal substance and turned into the ultimate in lazy consumer indulgence. Ironically, the more out-sourcing of life goes on, the less what is left might be deemed to be ‘worth’ much at all. There will always be differences in society of course – but as far as I can tell, like-for-like people in the U.K. somehow seem more resigned and cynical than their continental peers; the greater passivity in their choices of lifestyle betrays something. Only those with heaps of cash seem able to escape the general precariousness of daily British life; for the rest the sedentary dependence on junk culture, shoddy goods and the dream of unearned fame is an expression of the failure of a society to come up with anything better to live for, rather than evidence of how well we are doing. And the very urge of the rich to buy their way out of wider national life in itself says a great deal – a phenomenon that seems much less marked on the continent. Most concerning, it seems to apply as much to the educated as anyone else; the present educational direction seems intent on tying people ever more tightly into that world-view rather than liberating them from it. Again, perhaps the significant point is that (externally applied) education alone cannot a good life make. It’s what you do with what you’ve got that counts. The only other way to escape is to retire – and the expressions of utter relief from those I know who have done so recently itself says a lot about the experience of their working lives. One encounters many people who are highly-qualified; some of them come from relatively privileged backgrounds, others much less so. But what so often strikes me is that there seems to be no correlation whatsoever between those individuals’ levels of education and their general outlook – except, perhaps, for the absence of severe hardship. For the dullness and pressure of even many professional-grade lives in the U.K. can only say even more about what it is like ‘lower down’. Above all, there seems to be very little cognitive impact of their education: some of those people do have knowledgeable, enquiring minds – those who are ‘individuals’, who are great company, inspirational even , not because they all match but precisely because they each have something unique and engaging about them. But I encounter more of their type on the continent; in more cases here, the experience of becoming educated seems to have almost no real impact on lived lives at all – except (sometimes) the amount of money in pockets. Many seem still to have narrow perspectives and horizons, even on any perceived ‘purpose’ or context for their own lives. Where is the personal impact of all that education? I am not entirely exempting myself from the matter either. I like to consider myself a thoughtful and reasonably knowledgeable person – but I attribute that largely to my upbringing and innate curiosity, and cannot say with certainty that my schooling had any more than a reinforcing effect. In that sense, I am no different from those others I may appear to be criticising. But I’m not really seeking to criticise people for the lives they choose to lead, so much as suggesting we may be wrong to believe that the key determinant of the quality of those lives is formal education. But if this is so, one wonders why we are so mistaken – and how it turned out so differently elsewhere. What is lacking in the culture of this country that results in such a hang-dog approach to life? Maybe we are hoping that external ‘training’ can make up for the lack of something much more inherent and personal? In many ways, ‘ordinary people’ are the same everywhere; they largely have similar concerns and problems. Except that some of them are fortunate not only to live in beautiful surroundings – but also in well-made buildings, in settlements where people clearly take a pride in their communities and in their relations with others, where civic institutions are strong and there is at least something of a social safety-net. There remains an unassuming sense of the good life, that life is worth living, an opportunity to be seized, that can be seized. It was expressed by the sense of general conviviality present in that restaurant the other evening, by the way each new arrival was generally greeted and each departure bidden goodnight – visitors and locals alike. But those things did not happen by accident: they are the product either of people deciding those things are important and behaving accordingly – or of making it clear that they will not settle for less. In the U.K., it seems that no amount of educational progress ever delivers to people anything more than a sense of the inescapability of the rat-race, of the need to gain at others’ expense, of the need to calibrate life in a way that still rarely delivers any tangible benefits. It’s about quantity, not quality. It does not deliver us better homes or roads, it does not improve our indifferent towns or environmental record. It does not improve the quality of our national discourse or widen the availability of our culture. And if the continent is not entirely Paradise, then the grim bits of this country, and the lives lived there, seem to out-do much of what at least the west of the continent can offer. ‘Opportunity’ seems to be conceived as little more than the ability to work harder and spend more. It certainly seems to do little to enlighten people’s thinking about the things that transform the treadmill into a life well-lived. I know that is not the entirety of life in the U.K. either – but the prevalent mood here often seems to be a sense of weary resignation. As I said at the start, perhaps education delivers the opportunity for divergent thinking – including precisely the ability to disagree with arguments like mine above – but I still do not understand why so many people here seem never to take their eyes off the ground and look to the stars, even when highly educated. The good life is not a matter of extravagant special occasions or the escapism of behaving badly – It is not a matter of shiny-eyed Panglossian over-optimism, so much as attending to the quality of ordinary everyday life. Our education system seems unable to help people to appreciate that – indeed it seems to be sending them in the opposite direction. But maybe realising such things is not a matter of formal education anyway. In which case, one is left wondering what on earth all the pressure is actually for. The debate about the respective positions of traditionalist and progressive education shows no sign of abating. Earlier today, Old Andrew posted a reflection on the role of knowledge in education – which is perhaps widely seen as the totemic difference between the two sides. And yet it appears that the traditionalist camp (within which I broadly count myself) isn’t as united in its understanding of this as it might seem. The observations that followed betrayed a wide range of understanding, not to mention conflicts, regarding the respective positions of progressive and traditional education. For example, if you support the use of education for the transmission of a canon of knowledge (particularly of ‘great thought’), then it seems that this also labels you as a supporter of the Establishment. To belong to this camp, you must apparently also subscribe to the view that education is all about passing exams, and that the purpose of the whole undertaking is to ready people for their place in the grand economic plan. This caricature of traditional education is about as far removed from my own understanding as it is possible to be, as supported by my own experiences at a grammar school in the 1970’s. Employability was about as far away from the lips of my teachers as it is possible for a word to be, and few of my teachers were straight apologists for the intellectual or social Establishment. In fact, many were sceptics and cynics in the mould of a great part of the teaching tradition. To my mind, it is actually the progressive tendency that has had the utilitarian understanding of education, arguing that transferrable skills are more important than specific knowledge, that external applications are more important than intrinsic value, and that child-centred approaches are more important than the knowledge of the teacher. Contributing to Andrew’s discussion, I suggested that the whole point of traditional education is to keep it academic – but it should be noted that the OED offers two definitions of the word, and maybe this is where the misunderstanding lies. That second definition is: not of practical relevance; of only theoretical interest. chriswmparsons criticised my view that the whole point of traditional education is to leave the wider purpose of study indistinct. Much to my great surprise, he argued that my position was so relativist as to be ultra-progressive. Nothing could be further from the truth. If you accept this definition as opposed to the other one (relating to education and scholarship), then one can only conclude that traditional academic education must essentially remain open-ended. To assign specific purpose to one’s study is to make it contingent on that end. In other words, we define its purpose before we actually know what it is. To define something in this way is to place limits around it and this is anathema to true, open-ended intellectual thought. Certainly, and rightly in my view, traditional education espouses the teaching of an accepted canon, and it prefers clearly-defined techniques for doing so – but this is to conflate its method with its purpose. It ignores the fact that the canon itself was evolved over a period of time and constitutes the collective wisdom of many individuals, where speculative thought was essential and disagreement frequent. In many cases, the refutation of prior wisdom is precisely what led to the validity of the established canon – in a sense it’s a matter of what has withstood trial by destruction. So I do not for one moment think that traditionalists should reject any notion of radical dissent, nor that they need become meek organs of the establishment. The key here is that the traditional education is a) founded on substantial academic procedures and b) it tends to make progress by evolution rather than revolution. The only way to facilitate this process is firstly to make people aware of what the ‘accepted wisdom’ actually is, and secondly to provide them with the means of rigorous evaluation of it, in the form of critical thinking skills. “It is a tradition that flows through time, picking up new flotsam as it goes, leaving some things on its banks in the process. At any given point, its content and form may be a little bit different from places further up or down stream, yet it remains recognisable as the same tradition”. …change, within tradition tends not to be revolutionary or even rapid, but incremental, considered, evolutionary. That is not to say that radical new ideas or approaches do not appear…but time tends to be the judge. Roots are important, as is an appreciation of where things come from, where we stand within the stream, and how to use that knowledge to create fresh and meaningful art going forward. We need to be clear about the difference between method and purpose. It is one thing to employ traditional teaching techniques in the classroom, but quite another to consider that their only purpose is to embed an uncritical, unchanging view of establishment values and tastes. One of the key attributes of real academia is the process of critical review. Consequently, traditional teaching may involve rejecting or downplaying utilitarian views of education. What and why one teaches is as important as how, and if you only think that education is about passing exams or securing employment, then your practice will reflect these views. Traditional teaching may indeed have a relativist purpose – it refutes the idea that education is for anything in particular, and by doing so it accepts that it can indeed be ‘for’ anything at all – whatever each individual chooses. In that sense, it is a democratising force as it leaves each individual sovereign to interpret the experience as they choose, not as an external agency pre-specifies. As the excerpts from Gary West’s book show, traditional education need not be backward-looking or regressive. Tradition is best used as a force for informing the future. Likewise, traditional methods need not be preserved in aspic – they need to be able to adapt to changing times, while still retaining their emphasis on the acquisition of knowledge and the power of critical thought. In my opinion, it is absolutely essential that such misunderstandings are cleared up; the conflation of traditional teaching with Victorian values and social regression cannot help its cause one iota. 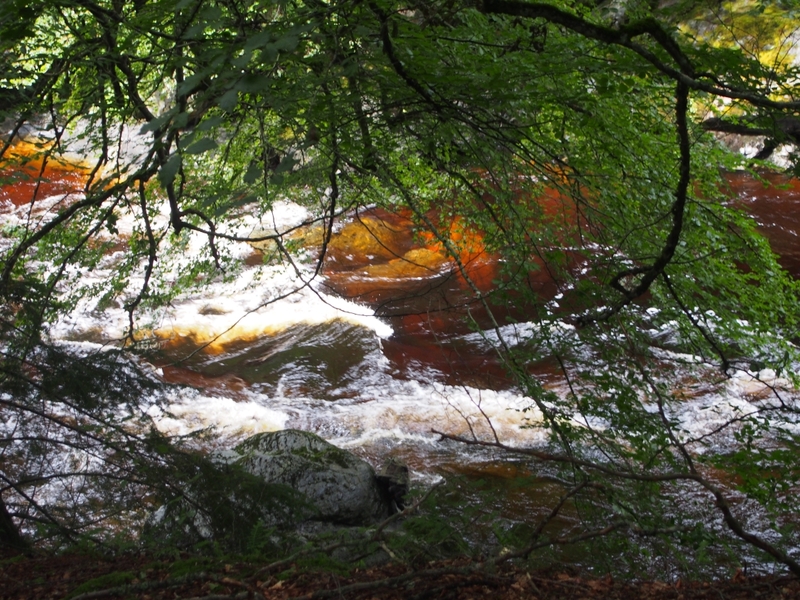 There’s nothing like a walk up through the woods by a timelessly tumbling Scottish river to reduce National Curricula and exam targets a more appropriate level of significance – and distance. The manic obsessions of the school year tend to make such things loom far larger in all our lives than they really warrant, for all that real, life-enhancing education is important. They are not the same thing, anyway. While we were away in Scotland, I was reading Gary West’s book Voicing Scotland. Rather esoteric, perhaps, to be added to this blog’s reading list, but of much interest for someone involved in playing traditional music. It also unexpectedly shone a useful light on our professional debate. The Carrying Stream is the title of one of my all-time favourite recordings of Scottish music – beautiful tunes and songs, as far as can be imagined from the tartan tat of popular misconception. West’s book concerns the role of traditional folk arts in a modern cultural context, as relevant to the debate and forthcoming referendum on independence in Scotland, and he uses this same phrase in his introduction when considering what the word ‘tradition’ really means. Traditional teaching has been much in the limelight in the past twelve months, being variously promoted as the salvation for falling educational standards and dismissed as a retreat towards the dark days of rote learning and corporal punishment. West’s analysis shed a little light on my own dilemma in this respect as well. Over the years, sheer experience has shown that for me at least, traditional methods work better and make more sense in terms of my own understanding of what education is, and is for. At the same time, I am resolutely modernist in most matters, and have little time for indulgent nostalgia. Teachers as a breed need to look to the future: their entire work is founded on the notion that the future can improve on the past – but they also need to respect the legacy that that past endows. So where does this leave the supposedly redundant methods of ‘traditional’ teaching? West resorts to the notion of the carrying stream to explain. In his view – and he quotes the Scottish poet and intellectual Hamish Henderson – the carrying stream flows out of the past and into the future, linking our past accomplishments and understandings with those yet to come. West also points out that a stream, in flowing, is not like a pond which is indeed static. He suggests this is the difference between tradition and convention, the latter of which is indeed stagnant and adhered to ‘because it has always been this way’. Traditions tend to die when they become mere convention, as they need change and evolve to keep them alive. This is precisely what is happening in traditional Scottish music at present, as a new generation of brilliant young musicians reinterprets age-old songs and tunes for the present century. See here and here. For me, this neatly sums up both the objections to the perpetual revolution that is supposedly going on within education and the virtues of a more considered approach. It demolishes the claim that ‘traditional’ does indeed mean going back to Victorian models of education, while accepting that the crucial element within education – human need – really doesn’t change very much despite all the technical developments going on around. Education is a deeply humane, largely non-technical process for which there is no quick fix. All of our great professions draw on traditions going back millennia; it is only in recent times that we have fallen prey to the conceit that we need to be rid of all that for the sake of supposed modernity. Rather unexpectedly, I found Gary West’s book to provide an excellent resolution to my own modern/traditional dilemma, and I like his counsel that we should approach new supposed-panaceas openly but cautiously. Recent educational history would seem to justify this, and suggest that it is time for a readjustment. Reading his book also transmits the richness and depth of tradition in Scottish culture, something that I feel is perhaps lost on many of us mongrel English; maybe as a profession, we would also do well to hallow our traditions and established wisdom (not mere conventions) rather more than we do. My intention in the forthcoming year is to be less apologetic for my use of traditional methods, while remaining (as always) sceptically open to new developments. I am going to need to re-think some ideas, as I have spent the past quarter-century effectively denying what my intuition was telling me made sense all along in order to accommodate the short-lived fads that my employers demanded. The Carrying Stream itself embodies an ancient concept whose use in the modern era would seem completely apt.